Verbier has luxurious charm while maintaining its attractiveness as an Alpine village. The resort offers sports events all year long, rich cultural agenda, active nightlife, a wide range of shopping, gastronomy and sightseeing possibilities - everyone must visit the resort at least once in his lifetime to experience the adventure of a lifetime. If you are planning to go on ski holidays with your whole family then Verbier will be a great choice too - plenty on and off snow activities to choose from for every taste. If you agree that visiting this international and sunny resort is a must then be sure to choose Alps2Alps for the most convenient ski transfer to Verbier. 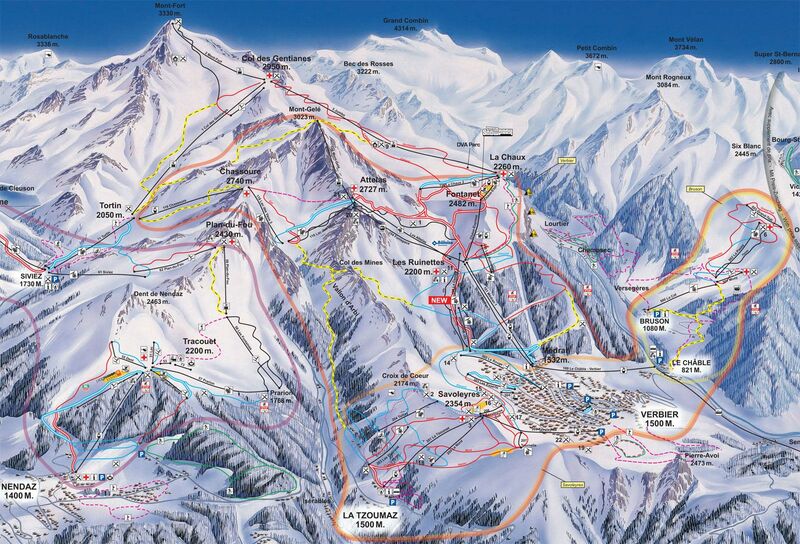 Verbier ski resort is located in south-west Switzerland and is the main resort of 4 Valleys ski area. The sun-kissed resort has a variety of ski pistes and extensive off-piste terrain - just hire a guide and explore probably the best off-pistes of Swiss Alps. Although it is quite pricey and sometimes referred as the winter playground for the rich and famous, everyone can find the perfect activity for them - Verbier not only has world-class pistes, it is also a freeride paradise, offers night skiing, husky dog rides, ice climbing, horse-drawn sleigh rides and much more. There are no direct train connections to Verbier ski resort - the nearest train station to the resort is La Chable, about 10km from Verbier. There is a direct bus to the resort operating daily. Midweek (Monday-Friday) transfer means that the prices will be up to 60% lower than weekend prices - during the off-season and off-peak your savings will be even bigger. When we calculate your transfer price to Verbier vehicle availability, vehicle utilization, schedule of transfers and other costs like road tolls and parking fees are all taken into consideration. If you are planning to travel to Verbier as a larger group or there are any other specific needs, get in touch with us directly. Verbier ski resort is the main part of 4 Valleys ski area giving you an access to a total of 412km - with appropriate ski Lift Pass you will be able to explore Bruson, La Tzoumaz, Evolene, Nendaz, Siviez, Thyon les Collons and Veysonnaz resorts as they all are part of 4 Valleys. Unusually for a ski resort, children under 8 ski for free. Also, there are huge discounts for 9-14 year olds. Local ski schools are highly rated and can guarantee to help improve your skills quickly and with ease. The resort itself is a quite compact size and offers spectacular mountain restaurants and bars to sit and chat about experiences on the pistes. Verbier has a cinema, ice skating rink, indoor rock climbing and swimming are also offered, therefore every member of the family will find something that fits his needs in this winter paradise. The exclusive Verbier ski resort is always in high demand, therefore be sure to book your transfer as soon as possible and remember that you can always write us or call us if you have any questions - we Alps2Alps are here for you to provide the best possible ski transfer.